With the start of Fall, deep jewel tones and vampy shades are in- all hail the return of burgundy! With an enormous number of gorgeous burgundy polishes cropping up in Fall collections, I’m turning to one of my favorites today: Pahlish’s “Blood of the Mountain.” I know…it isn’t from. New collection, but I recently managed to acquire it, so it’s kind of the same? 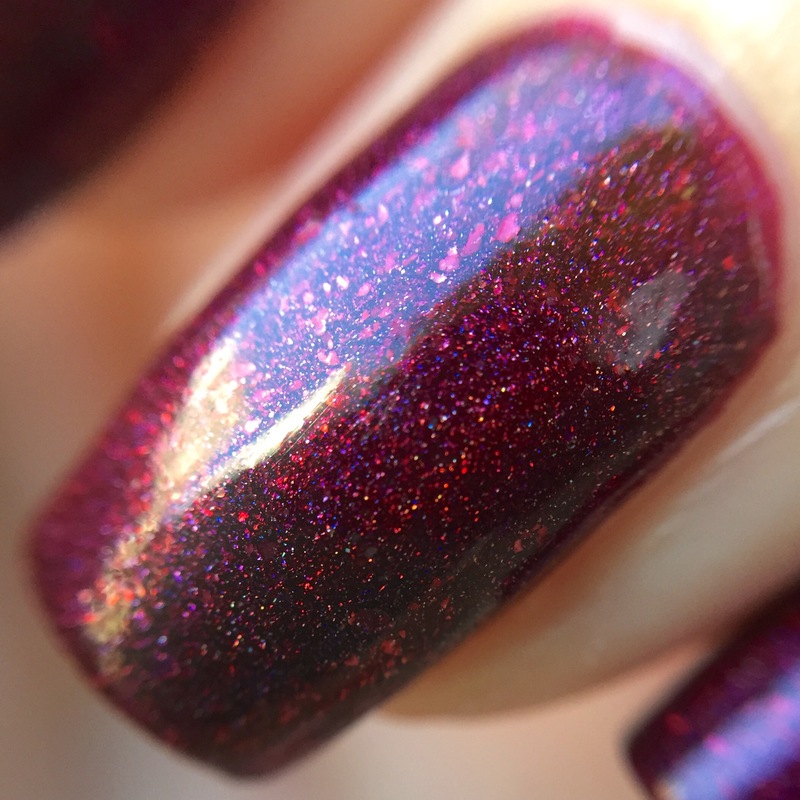 “Blood of the Mountain” (which I sincerely hope is the WoW reference I think it is) is a dark red holo with gold-toned flakies. In the sun, the flakies give it a bit of a metallic look, and in the shade they peek through the base for sort of a “dark potions” look. The formula, like almost every Pahlish I’ve ever used, is total perfection. Consistency is spot on to make it a dream to use, and the two thin coats practically painted themselves. Yay for the darker colors of Fall- opacity is up and painting time is down! 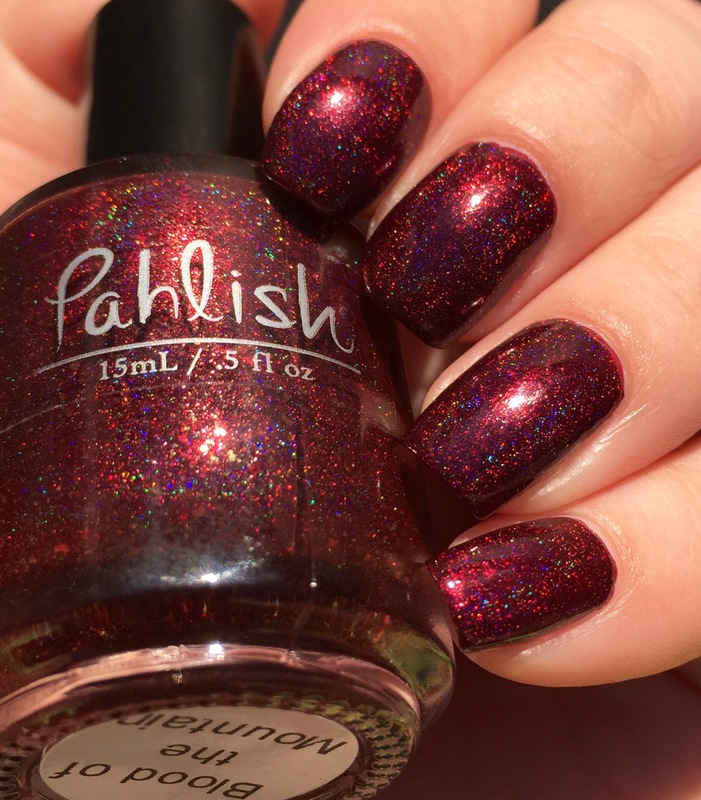 If you’re obsessed with Pahlish burgundies (like me), you may be wondering about similarities between a few polishes from different years and collections. I discovered that I had “Blood of the Mountain,” “Virgin Queen,” and “The Heavenly and Primal” (reviewed here) all in my collection and thought that it help be helpful to point out differences. “Virgin Queen” and “The Heavenly and Primal” both have a darker, slightly more purple base. Those two are definitely more “blackened” and “The Heavenly and Primal” appears plum/deep purple in the shade. “Blood of the Mountain” leans redder (more sanguine) both in the sun and the shade. The inclusion of gold flakes make it a little more similar to “Virgin Queen” (which has flakes) than “The Heavenly and Primal” (which does not have them). No dupes here. 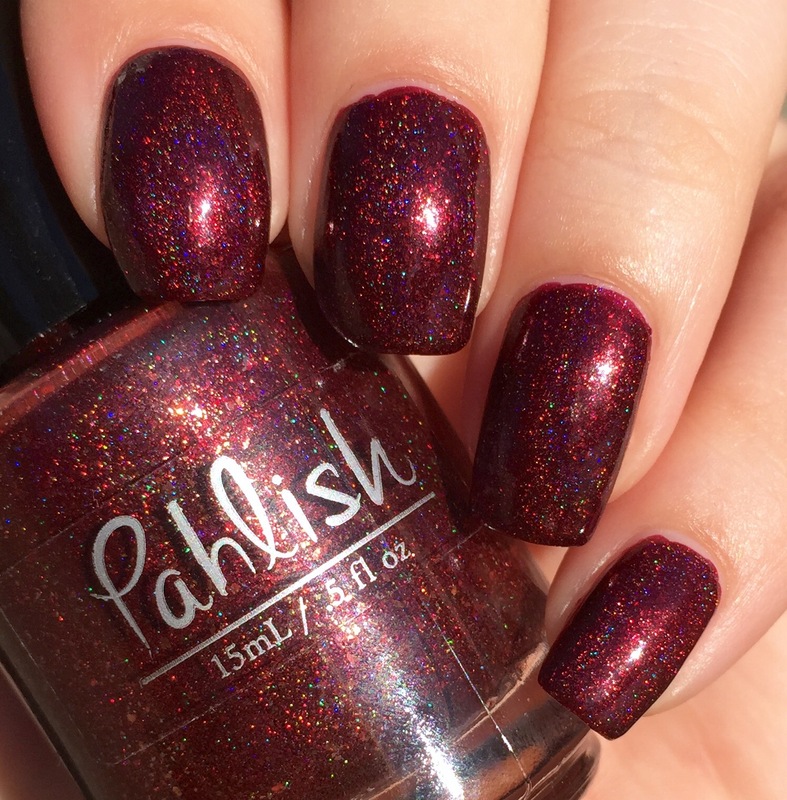 You cannot get “Blood of the Mountain” from Pahlish’s site at the moment, because it is from a past collection. 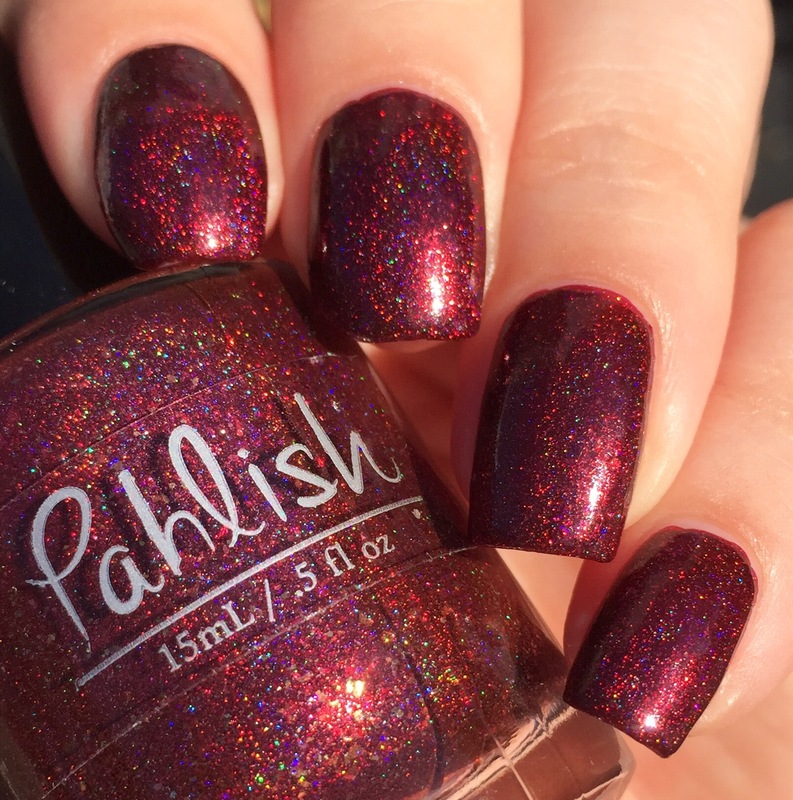 However, if you keep your eyes peeled, Pahlish sometimes brings back a few batches of old favorites. This was my first Pahlish! I still love it. 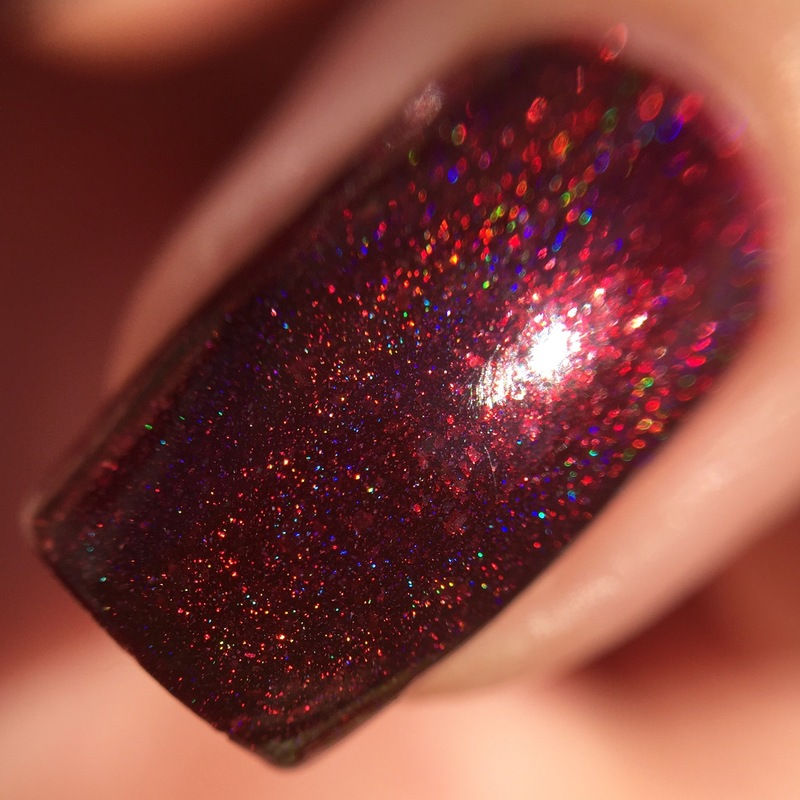 It’s a perfect dupe for Enchanted Polish’s Mr. Burgundy. I always thought it was a Dr. Who reference, though. I could be wrong. Ughhhh this is so freakin gorgeous!!!!!!! oh this is delightful. Such a good color for the season! Such a great color! I love a good dark polish. So vamp and gorgeous! I love how you captured it, the holo finish is so strong.